Description: Its Ribs, Its Bacon...Need we say more??? Set up Monolith for indirect cooking using the second tier stainless grid on top of the standard grate. Cut the rack into individual ribs while they are still raw. Place all ingredients except for the olive oil into a food processor. Pulse the ingredients to blend slowly adding the olive oil to the mixture. 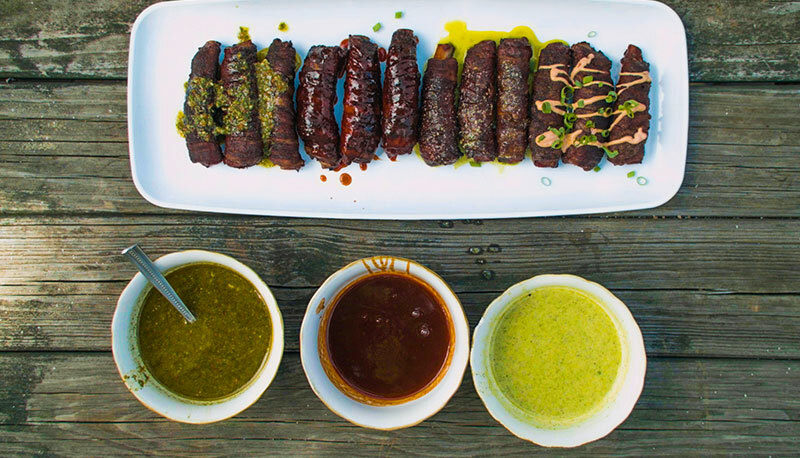 Taste the chimichurri for balance. Add salt, vinegar or olive oil depending on your personal taste. Taste for balance, add salt if needed and place in the fridge to set for 1 hour. Combine ingredients and mix well with a spoon. Place into a squeeze bottle and place in fridge for 30 minutes to allow flavors to blend. Its Ribs, Its Bacon...Need we say more?? ?